As I write this, I can feel a breeze through my open window, and I’m not getting frostbite. It’s March, so we’ll chalk that up in the “win” column. I can hear birds singing, and the trickle of water running down a downspout, too, so chances are there’s a trickly downspout near you. 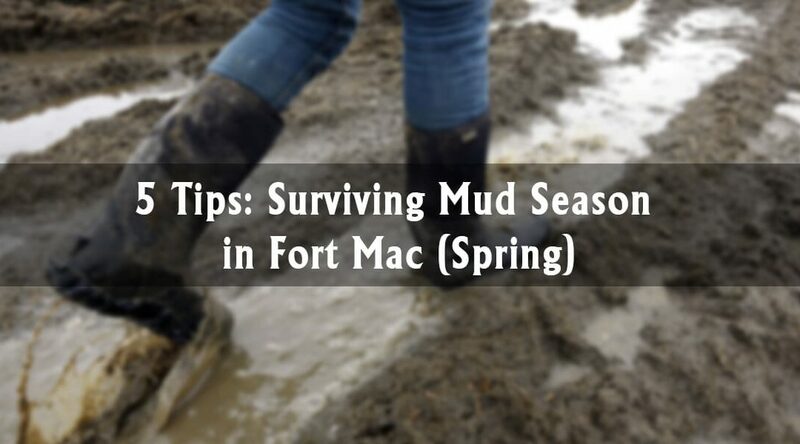 It’s mud season in Fort Mac, which is a great time of year! How do we survive this season? Stock up on windshield washer fluid and catch up on vitamin D whenever possible so you don’t have to be grumpy anymore. That’s about it. It’s a little late for this, but ideally, you’ll poke your head up there about 2 weeks ago. Is there any ice/frost on the underside of the roof? Is there any evidence of water/moisture on any of the wood or insulation? If so, this could spell trouble as it warms up. A good home inspector, insulator or roofer will be able to prescribe a solution before any of that water permeates into the home. You’ll want to stop the source of moisture, as well as mitigate any existing damage, ASAP. Pro tip: Keep records of anything you/they do, including photos. Brian Slaney (home inspector) has always told our clients to keep downspout extensions on the bottom of your downspouts and have them discharge as far away from the foundation wall as possible. Many of us keep our downspout extensions up in the winter, so don’t forget to put them down, and do any maintenance on them now so they direct moisture away. This will minimize issues from snow-melt or rain – too much of which can, over time, cause foundation damage, especially if you have a PWF foundation. This puppy is about to get some really good use, so be sure to check that it is working. If it isn’t, call a qualified plumber and let’s get it fixed before you have any issues. This pump can be found in a barrel set into your basement floor (but don’t look forever, as many homes don’t have them). You can have two pumps, or a sump alarm – even one that connects to your phone via wifi. If you go this way, there may even be insurance benefits (cheaper rates), so be sure to talk to your insurer about that if you install these extra protections. One last point on sumps. In some parts of town (most of New Timberlea (2000-2006), for example), you will want to remember to uncoil the black hose at the exterior of the home, making sure that it is discharging into grass, a long way from the home, or any potentially slippery sidewalks. Fire season is next after mud season, (are you looking forward to bug season?) and it’s always a good idea to get a head start with clearing unnecessary combustibles. Perhaps you left some leaves out last fall? Maybe you have a pile of wood right next to the house? For the best advice, you can follow firesmart’s guidelines (link or insert social media). If you can’t tell if your firepit is safe, check out the RMWB’s site before you light a fire. They can even send someone from the fire department around to check it out. Have fun out there, everyone, and please remember to use qualified professionals to work on your home for you. If you’d like referrals, please don’t hesitate to contact us. And if you’re looking to move this spring as well, we’ll sell your home for top dollar, so please feel free to reach out so we can help you (or give you a second opinion on your home’s value)!